Evolution occurs at both the micro and macro levels. Macroevolution is the eye-catching form, where we see species changing into dramatically new ones. This process though takes time and is not directly observable. Microevolution, while less “glamorous” is no less interesting. Indeed, it has applications that are amongst the most serious concerns in health, medicine and agriculture. This is the ability of populations of bacteria, protists, fungi, insects or plants to evolve resistance to antibiotics, drugs, pesticides and other chemicals used to control them. 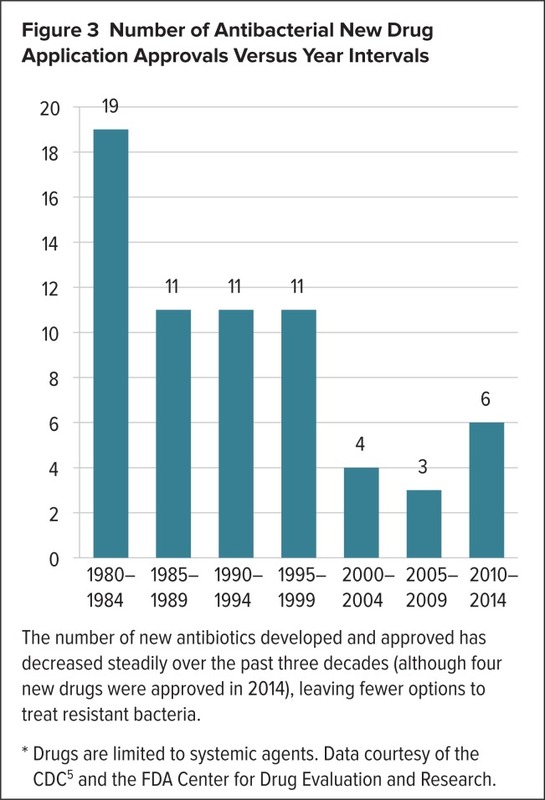 What is particularly concerning about this is shown in the following graph – the number of antibiotics being developed approved continues to decline, which leaves fewer options for treatment. Understanding the process of evolution is critical to estimating the number and type of new drugs that are needed to combat them. It is thus necessary to understand that antibiotic use represents a very strong selection pressure. Given the reproductive potential of bacteria (more offspring are born than can survive) and the variation that is possible (through both mutation and horizontal gene transfer) it should therefore come as no surprise that populations rapidly evolve resistance. Evolution and natural selection are thus not the dated musings of a 19th-century naturalist, but of critical importance to health problems of the 21st-century: in the US alone, over 2 million illnesses and 23,000 deaths per year are directly attributed to evolved resistance. From an assessment perspective, antibiotic resistance in bacteria is a great example to use when responding to and extended response question on evolution/natural selection. “About Antimicrobial Resistance | Antibiotic/Antimicrobial Resistance | CDC “. Centers for Disease Control and Prevention. Cdc.gov., 2016. Web. 11 Dec. 2016. “Microevolution”. Understanding Evolution. University of California Museum of Paleontology.Evolution.berkeley.edu. 2016. Web. 11 Dec. 2016.